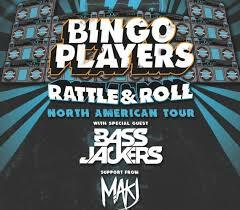 2013 has been a mammoth year for the Bingo Players duo. After multiple smash singles and epic live performance spectacles all over the world, Paul Baumer & Maarten Hoogstraten have just announced a massive fall tour. The "Rattle & Roll" North American bus tour boasts over 30 tour dates throughout October and November, hitting the biggest cities and clubs all over the United States and Canada. Bringing with them is a brand new stage production and a killer lineup of openers that consists of Bassjackers, MAKJ, and Carl Tricks. If you aren't already convinced that you need to get in on this massive tour, check out the "Rattle & Roll" tour trailer below.